Brain drain: Head motion in the scanner makes regions of the cortex appear thinner (red and yellow) than they actually are. Over the past decade, scores of researchers have used magnetic resonance imaging (MRI) to reveal structural abnormalities in the brains of people with autism. One of the most consistent findings is that the cortex is larger than normal during childhood and shrinks earlier than normal during adolescence. A new study calls these findings into question. The study, published 10 December in Neuroimage, shows that head movement during structural MRI causes certain regions of the cortex to appear smaller and thinner than they actually are. The study adds structural MRI to a list of brain imaging techniques that are confounded by head movement in the scanner. Functional MRI, which monitors blood flow as a readout for brain activity, and diffusion tensor imaging, which uses the flow of water along bundles of neurons as a measure of brain connectivity, are also sensitive to the slightest shifts. 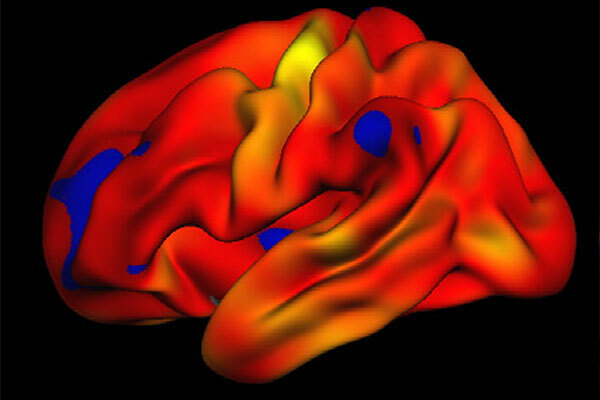 In the new study, researchers collected five structural brain scans from 12 healthy volunteers. During two of the scans, the participants tried to lie perfectly still. For the remaining scans, they were asked to perform one of three different head movements: nodding up and down, shaking side-to-side, or random movements. Half of the participants performed the movements for five seconds per minute in the scanner. The remaining participants moved for 15 seconds per minute. The researchers then calculated the average amount of movement for each participant, which ranged from 1 to 25 millimeters per minute. Each type of movement decreases the volume and thickness of gray matter, the cell bodies of neurons that form the brain’s cerebral cortex. Head movements as small as 2 millimeters per minute made it look like the participants had up to 2 percent less gray matter, on average, than they did when they were lying still. This is on par with the true loss of brain tissue seen in a person with mild neurodegenerative disease each year, the researchers say. Bigger movements result in larger apparent losses in gray matter throughout swaths of the cortex. The researchers estimate that each millimeter increase in movement per minute translates to a roughly 1 percent loss of gray matter. The decrease is most severe in certain regions of the cortex such as the temporal lobes, which are implicated in autism. The differences remain regardless of the type of software the researchers use to process the images. They also persist when the researchers manually exclude the blurriest scans most obviously marred by movement. It’s too early to say whether head movements skewed the results of studies that reported structural abnormalities in the brains of people with autism. But the new findings underscore the importance of safeguarding against head motion during brain imaging. This is especially important for studies involving people with autism, who are known to move their heads in MRI scanners more than controls do. This is an interesting article on an unfortunate drawback of brain scans. It is unbelievable to me how much funding and analysis goes into brain scans in the context of autism. As is well documented in the literature the vast majority of those with autism have abnormalities in biochemistry. See: http://www.plosone.org/article/info%3Adoi%2F10.1371%2Fjournal.pone.0112445. I wonder what would happen if half of the research funding that is currently going into brain scans was redirected toward research investigating autism biochemistry and double blinded trials of candidate treatments. A good (f)MRI study has the record of the head movement and then you enter the x y z (rotation and translation) into a regression model to remove the veriance caused by head movement, this is standard procedure.